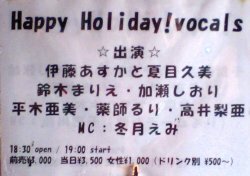 This was a singing event featuring several minor idols. The emcee for the event was Fuyutsuki Emi (formerly Shinohara Emiko). I went to see Itou Asuka. I arrived around 19:30, and the second performer was on the stage. There were around 20 people in the crowd, front row sitting and others standing. I stood near the back. Fuyutsuki Emi was the third performer, and she sang one song. Asuka was the fourth performer, and she paired up with Natsume Kumi. They sang three songs. Asuka was wearing a black outfit with a frilly skirt. Kumi was wearing a matching red outfit. Asuka's stage lasted for around 20 minutes, and their songs were as follows. I used my 20D and 24-105mm F4L IS, and took 628 photos (ISO1600), with 193 of them worth keeping. I also brought my 50mm F1.4 lens, but the AF didn't work! I used it during the previous event (last month), and it didn't have any problems. Maybe it just died..